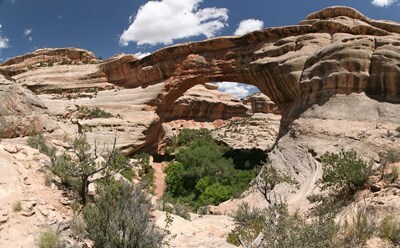 Sipapu Bridge is a natural bridge or arch located in the Natural Bridges National Monument in the U.S. state of Utah. The bridge spans White Canyon. Sipapu was long reported to have a span of 268 feet by the National Park Service, ranking it as the fourth longest natural arch in the world. A more accurate measurement obtained by laser survey in 2007 revealed the measurement to be a significant overstatement. This description uses material from the Wikipedia article on Sipapu Bridge and is licensed under the Creative Commons Attribution-ShareAlike License (view authors).